Classical Education is about equipping children for the future with what has been proven successful in the past. The roots of classical learning can be traced back to the age of the Greeks. The classical emphasis is built on a three-fold approach called the Trivium. The three foundational academic categories are grammar, logic and rhetoric. Most importantly, the Trivium corresponds to the three basic stages of a developing child. By following the path of development that children naturally take, Classical Education teaches “with the grain” and equips scholars to master the art of learning. THE GRAMMAR STAGE: These are the years in which the building blocks for all other learning are laid, with scholars learning the basic skills of reading, writing and mathematics. The child in the “Grammar Stage” (grades K-5) is mentally ready to absorb information and is naturally good at memorization, and this stage takes full advantage of this fact (although appropriate attention is given to meaning and comprehension, even at this first stage). This forms the foundation from which all other subjects can be approached, and there are many ways to get the job of memorization done including: lectures, readings, drills, dictation, tests, charts, flash cards, chants, songs. The most emphasized learning activity at this stage is memorization, both for purposes of cognitive recall and for building storage identities for future knowledge acquisition. So during this period, education involves not self-expression and self-discovery, but rather the learning of facts. Rules of phonics and spelling, rules of grammar, poems, the vocabulary of foreign languages, the stories of history and literature, descriptions of plants and animals and the human body, the facts of mathematics — the list goes on. Grammar teaches scholars how to read and how to understand what they are reading, and it teaches the rules for writing intelligibly, according to the rules of a particular language. This information makes up the basic building blocks in preparation for the second stage of education. Primary Faculties (skills): Observation and memory. Pedagogy: Reciting, chanting, learning by heart. End Result: Scholar becomes knowledgeable. THE LOGIC STAGE: By 6th grade, a child’s mind begins to think more analytically, and the scholar starts to study formal logic and argumentation. Middle-school scholars (grades 6-8) are less interested in finding out facts than in asking “Why?” The second phase of Classical Education, the “Logic Stage,” sees the young person as able to learn to argue his or her point, thus taking information, organizing it, and applying it in increasingly sophisticated forms. A scholar is ready for the logic stage when the capacity for abstract thought begins to mature. During the middle school years, the scholar begins the study of algebra as well as logic, and begins to apply logic to other academic subjects. The logic of writing, for example, includes paragraph construction and learning to support a thesis; the logic of reading involves the criticism and analysis of texts, not simple absorption of information; the logic of history demands that the scholar find out why the War of 1812 was fought, rather than simply reading its story; the logic of science requires that the scholar learn the scientific method. Pedagogy: Focused upon the beauty of economy of fine demonstrations of dialectic as well as analytical criticism of less exemplary forms. Use of “subjects” as “grist for the mental mill” to work upon. End Result: Scholar becomes a thinker. THE RHETORIC STAGE: The final phase of a Classical Education, the “Rhetoric Stage,” builds on the first two. At this point, the high school scholar learns to write and speak with force and originality. The scholar of rhetoric applies the rules of logic learned in middle school to the foundational information learned in the early grades and expresses his conclusions in clear, forceful, elegant language. The maturing scholar in the rhetoric stage has achieved the ability to communicate, synthesize and generalize learning across a range of disciplines. Pedagogy: Freedom to pursue own interests. End Result: Scholar becomes articulate. According to Classical Academic Press and Dr. Christopher A. Perrin, scholars around the nation in Classical schools typically score in the top 10-15 percent on national tests like the Stanford Achievement Test and Scholastic Aptitude Test (both tests are abbreviated SAT). Each year, the Association of Classical and Christian Schools (ACCS) will compare the SAT scores of classically educated scholars with national statistics. The class of 2012 averaged 621 in reading, 606 in writing and 597 in math, scores much higher than the national average. Additionally, Veritas Christian School, a Classical school in Lawrence, Kansas shows their 2009 SAT test scores in reading, language, math and science were three grade levels above the national average for grades 3, 5 and 7. The Effects of Classical Education on Achievement in Lutheran Schools, a research project conducted by Anthony Splittgerber and Dr. Bernard Tonjes, and presented to Concordia University in 2010, showed the results of the research indicated that there is indeed a significant difference in achievement between comparable Classical and non-classical Lutheran schools. The Classical Lutheran schools showed a steady improvement in achievement over time, while the non-classical Lutheran schools showed the opposite. It was also noted in the research project that the study of Latin was a key factor regarding the significant gains after 3rd grade in reading and language. Four years ago in the Archdiocese of Washington, D.C., officials were looking for ways to save St. Jerome, a failing school for scholars pre-kindergarten through 8th grade. St. Jerome had to come up with a solution or be one of hundreds of parochial schools across the nation to be closed. Thus, a group of parents, parishioners, scholars and homeschoolers came up with the country’s first-ever Catholic version of the Classical curriculum. Today, St. Jerome is a thriving Classical academy with quotes about chivalry and other virtues on the hallway walls. The school is bursting at the seams, with 130 applications for this coming fall, when it plans to increase enrollment to 300. Catholic schools near Rochester, New York, Denver and Lexington, Kentucky, have adopted St. Jerome’s curriculum and the emerging Classical catholic movement will hold its first conference in July. Classical Academy Charter School located in Clifton, New Jersey, shares from 2000 through 2008, the Classical Academy 8th graders each year outperformed, most often by large margins, their comparative cohorts in the Clifton public middle schools on the state required 8th grade exams which test Language Arts, Mathematics and Science. Their scholars’ 2012 ‘ASK-8’ state required exam saw the 8th grade class earn 100% “Proficient” (passing) for Language Arts, Mathematics and Science. Decatur Classical Elementary School (DCES) from Decatur, Illinois states that it “met federal education standards” with 99.3% of DCES scholars in grades 3 through 6 meeting or exceeding standards across the reading and math sections of the test with 4th graders additionally taking the science section. The demographics shows DCES has 41% White scholars, 16% Black, 15% Hispanic, and 28% Asian. 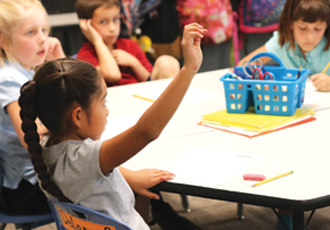 Poudre School District in Fort Collins, Colorado, adopted a Classical educational approach for public charter schools with Ridgeview Classical Schools, a K-12 charter school. In the U.S. News & World Report’s 2013 list of best high schools, Ridgeview Classical Schools ranked #2 in the state of Colorado and #103 in the country. Great Hearts Academies, located in the Phoenix metropolitan area, has set higher expectations for all scholars through a Classical liberal arts curriculum and was pleased to see a recent report in the Arizona Business Journal that ranked the top 50 high schools in the state of Arizona by SAT scores. Great Hearts Academies took five of the top 11 spots for highest SAT scores. Great Hearts Academies offers a rich program of art, music, foreign language, and literature alongside science and math. 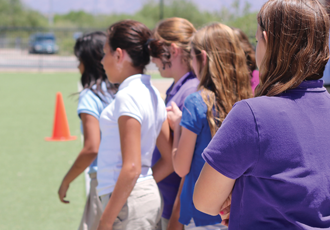 Great Hearts Academies operates a network of 15 public charter schools in and around metropolitan Phoenix, serving over 6,000 scholars in grades K-12 and delivering outstanding results. A course of study that includes Latin can make significant scholar improvement by developing their reading skills, vocabulary skills, study skills, math problem solving abilities, as well as attain higher test scores. Our Classical Education program has 30 minutes planned each day for the study of Latin starting in the 3rd grade, with an increase to 40-45 minutes of study in the 7th and 8th grade. SAT Scores: Across the nation, studies have shown Latin to be effective in improving Scholastic Assessment Test (SAT) scores. Studies conducted by the Educational Testing Service show that Latin scholars consistently out perform all other scholars on the verbal portion of the SAT. Reading Achievement: In the District of Columbia, elementary school scholars who studied Latin developed reading skills that were five months ahead of those who studied no foreign language and four months ahead of those who studied French or Spanish. Two years earlier, the same scholars had been excluded from foreign language classes because of substandard reading performance. Vocabulary Skills: In Philadelphia, scholars in the 4th, 5th and 6th grades received 15 to 20 minutes of daily instruction in Latin for one year. The performance of the Latin scholars was one full year higher on the Vocabulary Subtest of the Iowa Tests of Basic Skills (ITBS) than the performance of matched control scholars who had not studied Latin. Study Skills: Learning Latin improves study skills and improves knowledge of ancient history and culture. We are excited to offer the study of Latin to our families beginning at such a young age, and look forward to watching our scholars advance in their math solving abilities, their vocabulary and reading skills, study skills, as well as attain higher test scores as they progress through the years studying Latin at Leman Academy of Excellence. Saxon Math is the math program chosen by Leman Academy of Excellence and has been implemented starting in Kindergarten and will continue throughout each grade level. Independent research, longitudinal studies, and field-testing provide clear evidence that the Saxon Math program shows immediate, dramatic, and sustained improvement for all scholars. The Saxon Math program is based on an incremental pedagogical approach that emphasizes practice, review and frequent cumulative assessment. Over the past thirty years, research has suggested that there is value in a teaching method that uses small, easily understood pieces of information that are distributed across an extended period of time. It is the Saxon philosophy that mathematics learning should build on prior learning. Saxon Math’s approach to math instruction aims to ensure that scholars both gain and retain essential math skills. Math achievement and scores only increased over time. Test scores for mathematic achievement for grades 3 through 5 have consistently outranked the scholars in the state at the same grade level. 4th and 5th grade scholar scores on FCAT for math achievement have consistently risen each school year. Over the last five years, scores on the ISAT for mathematics have increased in grades 3, 4 and 5 - achievement scores for 3rd grade scholars increased 30 percentage points since 2005. Since implementing Saxon Math in 2006, scholars in 3rd and 4th grades at a rural school in Michigan have produced excellent scores for math achievement on the MEAP. Additionally, major findings from a study of the effectiveness of the Saxon Math program on elementary scholars concluded that the scholars who participated in grades K-3 made substantial gains in overall math achievement. I have also witnessed as an administrator, teacher and parent high scholar achievement and mastery of concepts for scholars in the Saxon Math program. Leman Academy of Excellence plans to teach Saxon Math at an accelerated level, beginning with Saxon Math 1 in Kindergarten, which should dramatically improve scholar achievement in math for our scholars. Whether or not a strong foundation of language arts skills has been established early on often sets the stage, and may strongly predict whether or not a young person will flourish in their future educational and career endeavors. In order to help improve upon the English language arts skills of our scholars, Leman Academy of Excellence has implemented Shurley English into our English Language Arts program. Shurley English is designed to help scholars master the key fundamentals such as vocabulary, mechanics, usage, editing and sentence work. Research and the analysis of the data performed by Dr. Mariam Azin and Miriam Resendez in May, 2010 revealed that Shurley English is associated with improved scholar language arts performance. Results showed that 4th and 5th graders using Shurley English demonstrated statistically significant language arts gains. Specifically, the percentage of 4th grade scholars who were proficient significantly increased by 4.3% and the percentage of 5th graders who were proficient significantly increased by 1.5 %. Overall, results obtained from this descriptive study done by Dr. Azin and Miriam Resendez showed that Shurley English is positively related to scholar language arts performance as measured by state assessment data. One of the essential features of Shurley English is the ongoing use of feedback through formative assessments. Providing scholars with information about how well they are doing on a regular basis was found to be incredibly powerful, so much so that researcher John Hattie analyzed nearly 8,000 studies and concluded, “The most powerful single modification that enhances achievement is feedback. The simplest prescription for improving education must be ‘dollops of feedback'.” Research found that the effects of feedback could increase achievement from 7 to 37 percent. The continuous use of feedback with Shurley English should provide significant scholar improvement in the writing skills of our scholars. Classical Education depends on a three-part process of training the mind. The early years of school are spent in absorbing facts, systematically laying the foundations for advanced study. In the middle grades, scholars learn to think through arguments. In the high school years, they learn to express themselves. This classical pattern is called the Trivium. The first years of schooling are called the “Grammar Stage” — not because you spend four years doing English, but because these are the years in which the building blocks for all other learning are laid, just as grammar is the foundation for language. In the elementary school years — what we commonly think of as grades one through five — the mind is ready to absorb information. Children at this age actually find memorization fun. So during this period, education involves not self-expression and self-discovery, but rather the learning of facts. Rules of phonics and spelling, rules of grammar, poems, the vocabulary of foreign languages, the stories of history and literature, descriptions of plants and animals and the human body, the facts of mathematics — the list goes on. This information makes up the “grammar,” or the basic building blocks, for the second stage of education. By sixth grade, a child’s mind begins to think more analytically. Middle-school scholars are less interested in finding out facts than in asking “Why?” The second phase of the classical education, the “Logic Stage,” is a time when the child begins to pay attention to cause and effect, to the relationships between different fields of knowledge relate, to the way facts fit together into a logical framework. A scholar is ready for the Logic Stage when the capacity for abstract thought begins to mature. During these years, the scholar begins algebra and the study of logic, and begins to apply logic to all academic subjects. The logic of writing, for example, includes paragraph construction and learning to support a thesis; the logic of reading involves the criticism and analysis of texts, not simple absorption of information; the logic of history demands that the scholar find out why the War of 1812 was fought, rather than simply reading its story; the logic of science requires that the child learn the scientific method. The final phase of a classical education, the “Rhetoric Stage,” builds on the first two. At this point, the high school scholar learns to write and speak with force and originality. The scholar of rhetoric applies the rules of logic learned in middle school to the foundational information learned in the early grades and expresses his conclusions in clear, forceful, elegant language. Scholars also begin to specialize in whatever branch of knowledge attracts them; these are the years for art camps, college courses, foreign travel, apprenticeships, and other forms of specialized training. Why is this important? Language learning and image-learning require very different habits of thought. Language requires the mind to work harder; in reading, the brain is forced to translate a symbol (words on the page) into a concept. Images, such as those on videos and television, allow the mind to be passive. In front of a video screen, the brain can “sit back” and relax; faced with the written page, the mind is required to roll its sleeves up and get back to work. A classical education, then, has two important aspects. It is language-focused. And it follows a specific three-part pattern: the mind must be first supplied with facts and images (grammar stage), then given the logical tools for organization of facts (logic stage), and finally equipped to express conclusions (rhetoric stage). But that isn’t all. To the classical mind, all knowledge is interrelated. Astronomy (for example) isn’t studied in isolation; it’s learned along with the history of scientific discovery, which leads into the relationship to science and from there to the intricacies of medieval history. The reading of the Odyssey leads the scholar into the consideration of Greek history, the nature of heroism, the development of the epic, and man’s understanding of the divine. Our approach to twelve years of education (grades 1-12) will consist of three repetitions of the same four-year pattern: Ancients, Middle Ages, Renaissance and Reformation, and Modern Times. The child studies these four time periods at varying levels — simple for grades 1-4, more difficult in grades 5-8 (when the scholar begins to read original sources), and taking an even more complex approach in grades 9-12, when the scholar works through these time periods using original sources (from Homer to Hitler) and also has the opportunity to pursue a particular interest (music, dance, technology, medicine, biology, creative writing) in depth. The other subject areas of the curriculum are linked to history studies. Our scholars who are working on ancient history will read Greek and Roman mythology, the tales of the Iliad and Odyssey, early medieval writings, Chinese and Japanese fairy tales, and (for the older scholar) the classical texts of Plato, Herodutus, Virgil, Aristotle. She’ll read Beowulf, Dante, Chaucer, Shakespeare the following year, when she’s studying medieval and early Renaissance history. When the eighteenth and nineteenth centuries are studied, she starts with Swift (Gulliver’s Travels) and ends with Dickens; finally, she reads modern literature as she is studying modern history. This pattern lends coherence to the study of history, science, and literature — subjects that are too often fragmented and confusing. The pattern widens and deepens as the scholar progresses in maturity and learning. 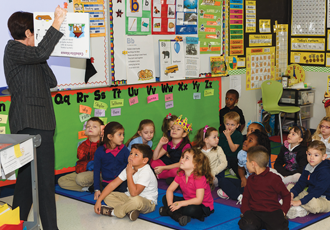 For example, a first grader listens to the teacher read the story of the Iliad from one of the picture book versions available at any public library. Four years later, the fifth grader reads one of the popular middle-grade adaptations — Olivia Coolidge’s The Trojan War, or Roger Lancelyn Greene’s Tales of Troy. Four more years go by, and the ninth grader — faced with the Iliad itself — plunges right in, undaunted. Rigorous study develops virtue in the scholar. Aristotle defined virtue as the ability to act in accordance to what one knows to be right. The virtuous man or woman can force him or herself to do what he/she knows to be right, even when it runs against ones inclinations. The classical education continually asks a scholar to work against his baser inclinations (laziness, or the desire to watch another half hour of TV) in order to reach a goal — mastery of a subject.